Access discount programs offer consumers deep discounts online and through mobile devices. As more consumers struggle with stretching their dollars, the companies that are able to offer savings solutions stand to earn a lot of engagement and goodwill. Access discount programs enable them to do that with minimal effort. Engagement and loyalty leader Access Development will be promoting its discount platforms at the upcoming National Association of Health Underwriters Annual Convention & Exhibition in Orlando from June 25 - 28, 2017. Conference attendees are invited to booth #800 to discover how Access can help companies generate higher profits by adding value for both policyholders and employee groups. For policyholders, Access discount programs help retain members by helping them save hundreds of dollars on everyday purchases. These benefits are a proven success with insurance groups nationwide, including many farm bureau organizations. For employer groups, Access offers Access Perks, a discount program for employees. 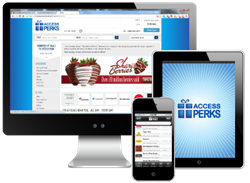 Access Perks features over 350,000 merchant locations offering deep discounts at local restaurants and retailers as well as popular national brands. The service helps employers add tangible, needed value to employees at a low cost. Visitors to the Access Development booth will have an opportunity to win a vacation resort stay, t-shirts, free memberships, and more. The Access team will also show visitors deals in their home zip codes to emphasize the difference between Access and other discount programs. For more information about Access Development, please visit http://accessdevelopment.com. For over 30 years, Access Development has helped organizations connect with their customers and build revenue, engagement and loyalty through custom incentives, employee benefits, and discount programs. The company’s private discount network of over 350,000 merchant locations is America’s largest, providing discounts of up to 50% on everyday items to millions of end users. Access also offers the nation’s largest mobile commerce platform, featuring over 200,000 merchants offering exclusive “show your phone” mobile coupons. For more information on Access, please visit http://www.accessdevelopment.com or follow us on Twitter and LinkedIn.